Patricia Holland (2009) describes family photographs as, ‘the medium through which individuals confirm and explore their identity ( L, Wells, 2009, p. 123). Certainly, I have about four boxes of family photographs dating back to the late 1800s. All those grandparent; aunts and uncles; cousins and, now, my own children and grandchildren. This is going to be a brief look but I’m hoping that I can comment both as a “user” of the photographs, bringing a wealth of surrounding knowledge, and also a “reader” teasing out meanings. (ibid p. 122). Holland also writes that taking pictures has become, “an increasingly flexible medium for the construction of ordinary people’s accounts of their lives and fantasies (ibid p.120) which is an interesting point given the way that memories can work. I’m not only having to take into account the vagaries of my memory but also those of my parents and grandmothers as they related family stories to me. 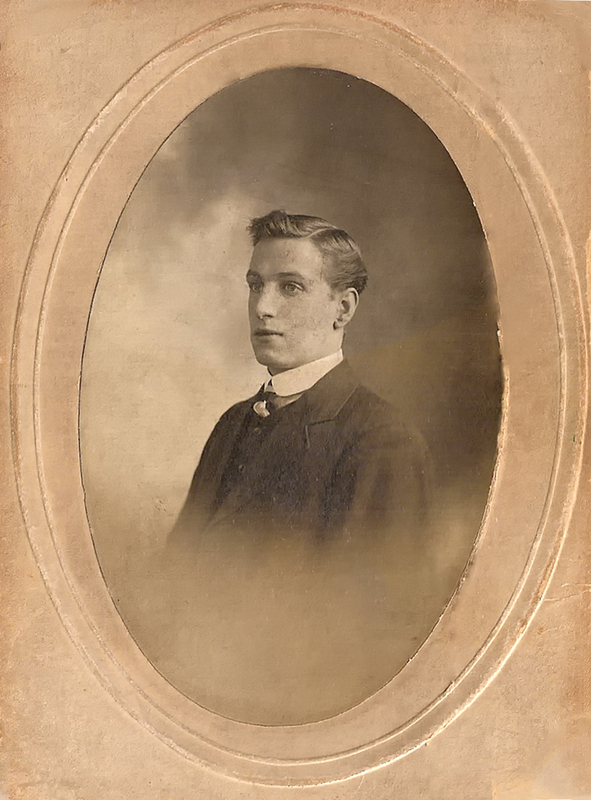 My maternal grandfather aged around 16. I think it’s a studio portrait with an unobtrusive background and stuck on a thick board ‘frame’. It has a handwritten number on the back (627) but I don’t know whether that relates to the photo or not because my grandfather had a habit of writing messages etc on the back of photographs which weren’t related to the photograph. Anyway it’s a classic head and shoulders pose, slightly sideways on and gazing into the distance. He looks older than 16 I think and serious. He was one of 13 children and the family were very poor. Are there any clues to that here? Just a young man having his portrait taken but I’m wondering why given his family circumstances. Maybe he was going away to work. The First World War saw a boom in camera sales which peaked in 1917. Parents and wives wanted to have a photograph of their husband/son as he went off to fight. 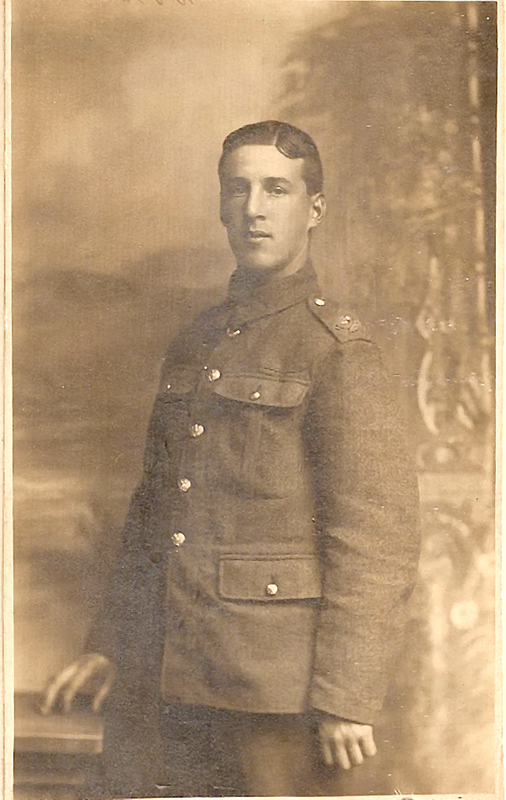 This was my great-uncle Daniel Donohoe who was killed in action in Flanders on 18th November 1916. He was killed at the point when my great-grandfather had been trying to get him out of the army because he’d originally enlisted under-aged. Holland asserts that most family collections are dominated by time spent away from home on holidays or days out – what she terms, “The domestication of the unfamiliar”. 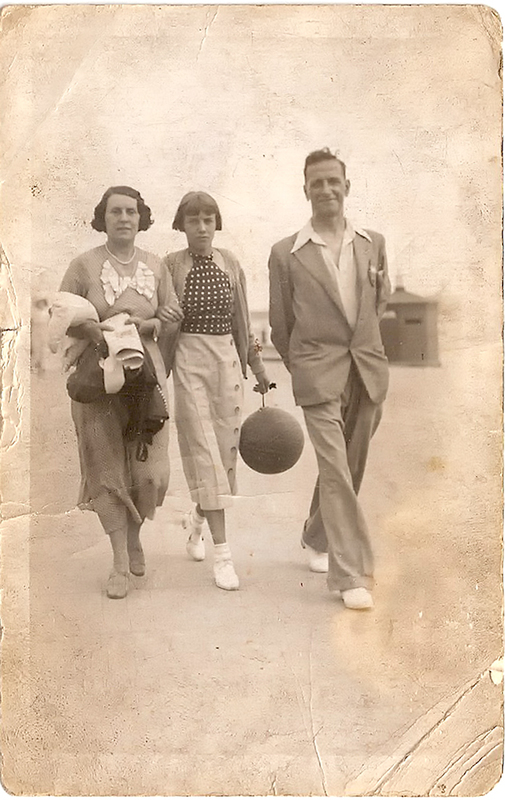 This my mother on holiday with her parents, aged around 12/13 and obviously not enjoying herself. No way was she going to smile for the camera. I think I remember her telling me that her dad wouldn’t buy her an ice-cream. The background is quite faded but the casual clothes and balloon mum is holding holding give a clue. In terms of composition, I like the way you get the sense of movement and there’s something similar about the posture of my mum and her father. 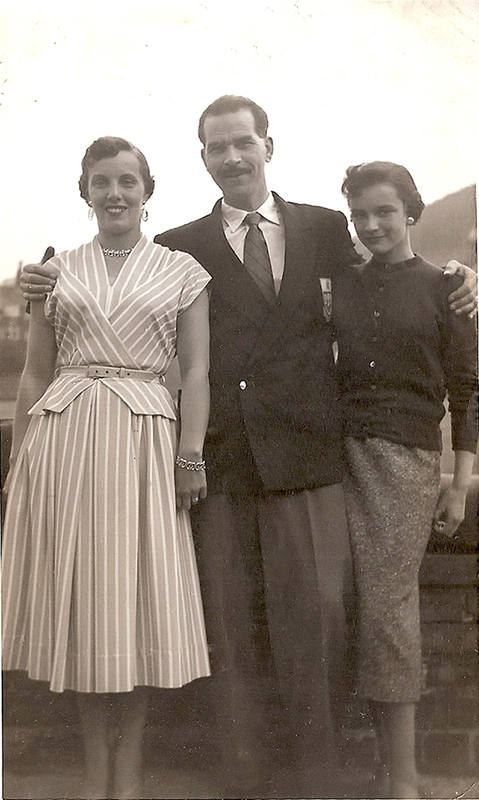 My grandad looks relaxed and comfortable in his stance whereas there’s some tension around his two ladies. 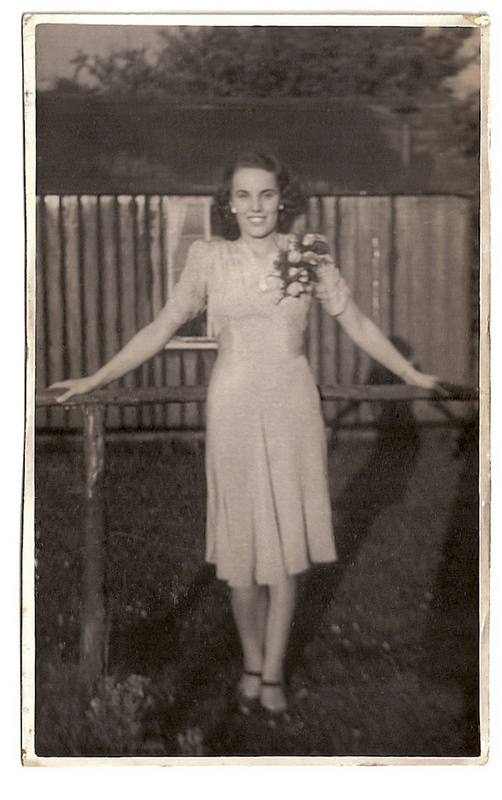 I can see a family resemblance between my mother here and the portrait of her young father. There they are on holiday not knowing that my grandfather would be dead within a couple of years – something my Nan and mother never recovered from really. “Children, especially, have very little say over how they are pictured, and this discrepancy is the source of many of the conflicting emotions analysed by writers on family photography” (P. Holland in L. Wells, p. 122). 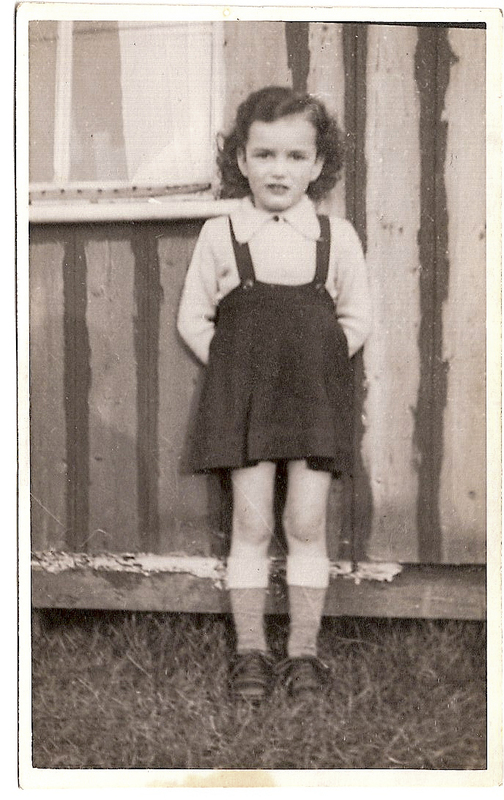 Me aged around 3 outside the house opposite to where we lived with my Nan. I think a distant relative of my grandad’s lived there. 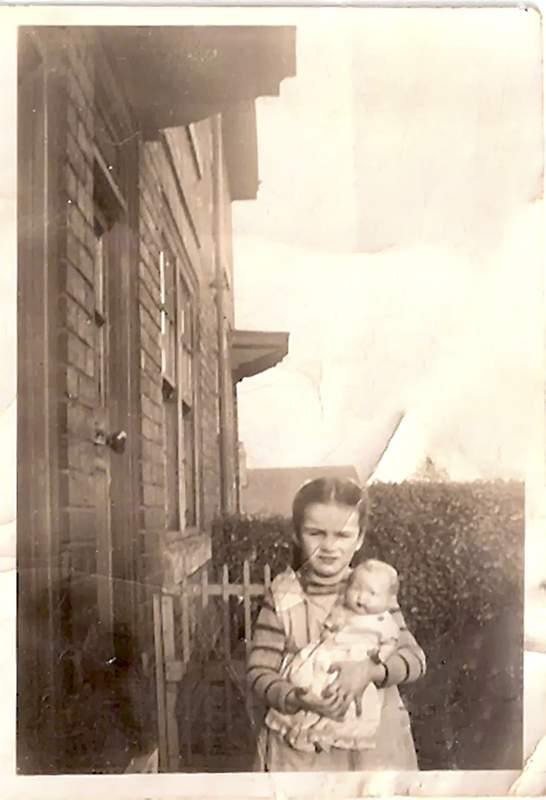 They had a male visitor who wanted to take a photograph of me holding my doll. He said he would give me a shilling. I can actually remember this and me feeling very cross and saying, “I don’t want your money!” My mum was horrified, “Ooh Catherine.” The event became part of family legend, “You’ll never believe what our Catherine said when ….. wanted to take a picture of her”. They couldn’t believe that I wouldn’t want some money. Goodness – what would I do with money when I was only 3. Sweets were rationed then so I never ate or wanted any. Looking at the photograph I can still feel that sense of annoyance. I’m sure I had more important things to do at home. Maybe I’d taken an instant dislike to him and didn’t want to be beholden. I’m certainly refusing to smile. The occasion has stuck in my memory because when I went back to Sheffield last year I even took a photograph of that house. I mentioned above the importance of photographs in the First World War. I think that such photographs had another importance as well. They could carry a message of love and also be a object of transference for children. 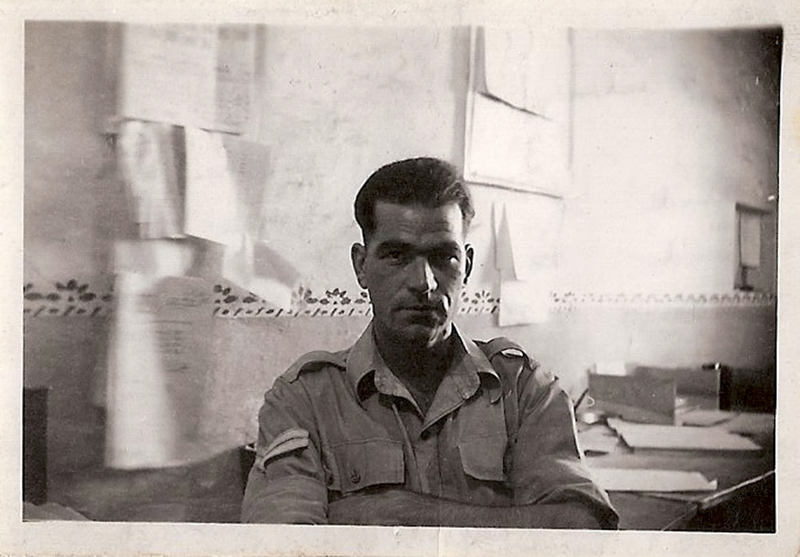 These are some of the photographs exchanged between my parents when my dad was in the Army in Egypt after World War II. Loving messages are written on the back. My father could see how I was growing up and I could see him – “Here is a photo from daddy who is somewhere far away but he sends his love”. I think he was talked about so much that, with the photos and letters to me, he was alive in my head and so never really ‘absent’. 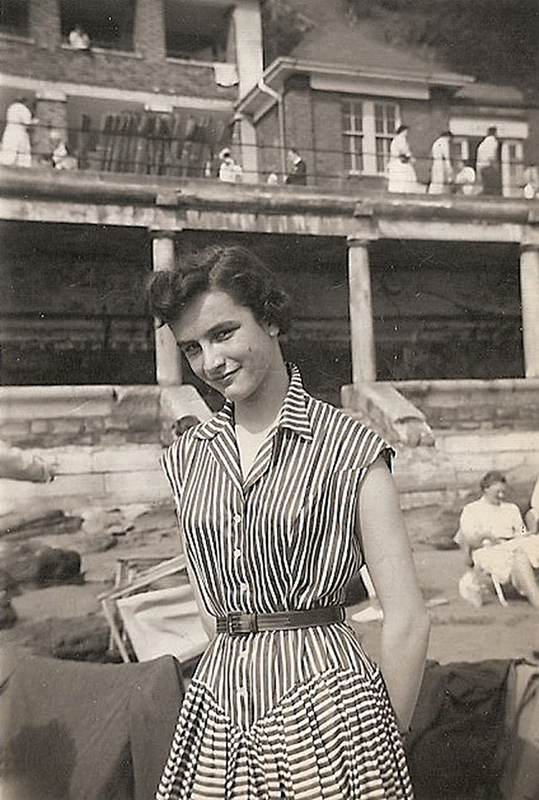 A holiday in Scarborough with me around 14 and quite happy to pose. It rained nearly every day. It’s good to see the context as it places it in time and a place. Stripes were obviously in fashion then. Note the coy pose – imitating a film star maybe. The same holiday, with my parents. My mother was thrilled to get a photograph of all of us together, as my father was usually behind the camera. Note the way I’m posing with that slightly coy, to the side look again None of that straight look at the camera that I gave when I was 3! I think this was early evening as we’re wearing smarter clothes, and that dad asked a passer-by to take this. I always find it quite frightening when someone asks me to do this in case I make a real mess of either the photograph, their camera or both! I began by writing that this would be a brief look. Well, I’ve covered the first half of the C20th! Holland is right when she says that family photographs kept are treasured less for their quality than for their context. These ones are important historical documents to me which place me within my family and help to carry personal and narrated memories. I don’t think either that these particular photographs embody any ‘fantasies’ about that family life.